The Graco G3 Standard Pump from MotionSource provides a high ROI and is a cost-effective pump designed to serve multiple markets and applications. With three controllers to choose from and multiple zone and feedback options, even working with your PLC. It Includes one adjustable pump element–standard, plus room for two more. Plus offering multiple reservoir choices, this is a multipurpose pump for almost any application. Offering the ultimate in flexibility–it’s a high value, custom fit on your application at an economical price. Extend machinery life, reduce operating costs and increase your productivity. Or email us at Sales@MotionSource1.com or use our handy “Quick Quote Form” and click send! The G3 Pump can be controlled using an external, user supplied, power source and controller. Some G3 pumps without controllers include a Low-Level Output Option. It can be configured with an M12 connector in code location “G” or with a DIN connector in code location “K”. (See Understanding the Model Number, page 4.) The low level signal is monitored across PINS 3 and 4. When the grease level has reached a low warning level, PINS 3 and 4 momentarily close (1 time per paddle revolution) sending the signal that the fluid has reached a low level to the controller. To ensure that a low level condition has been met, 3 or more low level triggers must be detected within 1 minute or less. When the oil level has reached a low warning level, PINS 3 and 4 close, sending the signal to the controller that the fluid has reached a low level. To ensure that a low level condition has been met, the low level trigger must be detected for 10 continuous seconds. Need assistance, have a question? Give us a call, 888-963-6686, help is a call away and it’s free. 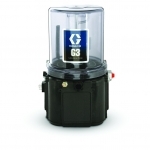 MotionSource is known as the The Source for Graco G3 Standard Pumps. Call or order today!